Or, why 1Password is broken in Chrome again. 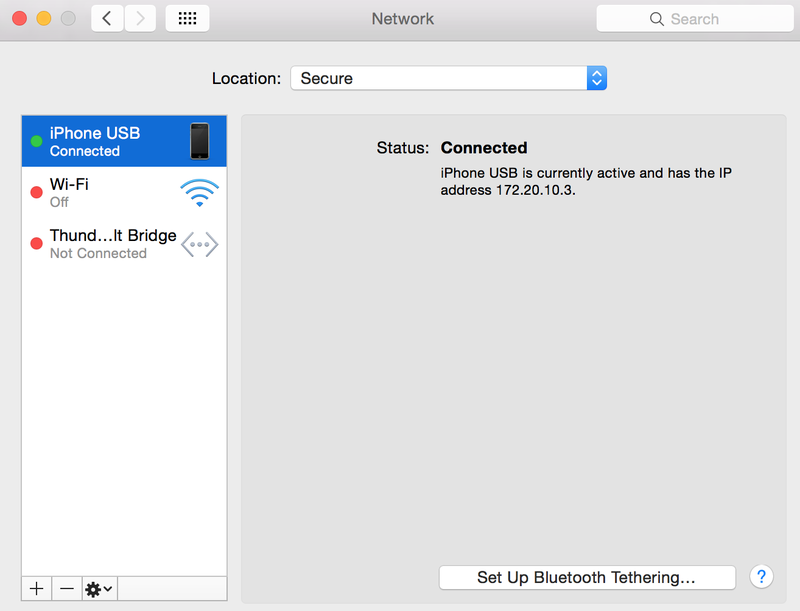 Future Alex: at some point, probably the next time there’s a major OS X update, you’re going to need to set up USB network tethering to your iPhone again because it stopped working for some miserable reason. And when you do, you’re going to remember that the USB Network settings page is inexplicably missing the Advanced settings button. And you’ll do that, and it’ll work, and you’ll get on with your day. But then you’ll realize that sometimes 1Password just refuses to start in Chrome for no apparent reason. And you’ll be busy trying to do stuff so you’ll just work around it by copy-pasting logins or by using Safari. And then other times it’ll work fine in Chrome so you’ll roll your eyes and forget about it till the next time it happens. Eventually you’ll figure out that 1Password only fails to work in Chrome when you’re tethering your phone over USB. So you’ll do some more googling and futzing about, and finally discover that 1Password needs the proxy to bypass localhost and 127.0.0.1. And by now you’ve again forgotten about the missing Advanced button, so when you try to fix it you’ll be about ready to slump wailing on the desk, never mind that the desk is in the middle of a public library. And suddenly, as if by magic, everything will work fine. Posted in UncategorizedTagged 1password, chrome, os x, proxyBookmark the permalink.